There probably isn’t a much more uniquie way to go sightseeing in Bangkok than with a Tuk Tuk tour. These three-wheeled motor-rickshaws are a typical part of the city. Even thought they can’t drive faster than 60 km/h (around 37 mph), it feels like you’re sitting on a rocket-propelled chair. 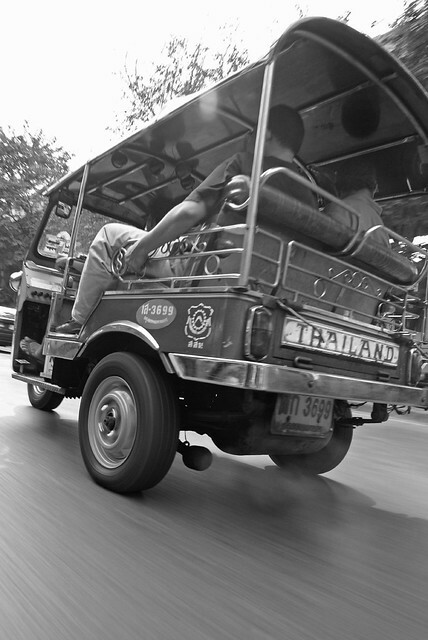 It’s funny that Tuk Tuks don’t actually come from Japan, at least historically – they were first imported from Japan. You can just hire a Tuk Tuk on your own – but be aware that Tuk Tuk drivers are nowadays some of the most notorious hagglers, they will often try to overcharge you or bring you to some shop (mainly tailors and jewelers) where they get a commission for bringing you into the store. Also, most of the tourist attractions where they like to bring you will pay them a commission too – so the fact that they tell you that the snake show is the greatest snake show on earth doesn’t really mean it’s the greatest snake show on earth, but it means that this particular snake show operator pays the highest commission in Bangkok to Tuk Tuk drivers who bring customers. The advantage of an organized Tuk Tuk tour is that you don’t have to go through all the hassle – and you get someone who can actually speak English, is knowledgeable and happy to show you interesting and fascinating places, answer your questions and explain the meanings of things you see. Two people fit comfortably in a Tuk Tuk (well, as comfortable as it gets in a Tuk Tuk), and three is still ok if you are a mid-sized foreigner. For adult Thai people, six can squeeze into on Tuk Tuk, and for kids, up to twelve, although the few instances where I have seen this looked like the kids were all performing yoga-poses. Tuk Tuks are now being exported to other countries all over the world, including Brazil, Egypt and Morocco. But even in Europe there are some companies who are trying to bring Tuk Tuks to the streets – although typically, the Tuk Tuk doesn’t measure up to European safety standards. However, a Tuk Tuk tour doesn’t mean you just sit in a Tuk Tuk – you also get out, walk around a bit. If you’re new in Bangkok, we recommend visiting the Wat Pho temple, the amulet market and the beautiful flowermarket with it’s millions and millions of colorful flowers and plants, and many traditional Thai desserts that vendors sell here. Warning:However, before you decide to join a tuk tuk tour in Bangkok, please be aware of this: it’s an open vehicle. The air quality in Bangkok isn’t good. You’ll be exposed to a lot of exhaust fumes in a hot climate. If you’re mentally prepared for that, then it’s ok – the fun you’ll have can more than make up for the annoyances. But if you are sensitive to exhaust fumes, we wouldn’t recommend this trip for you.